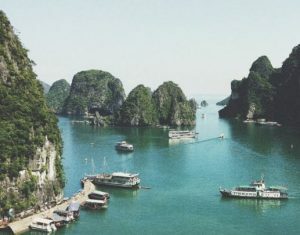 Vietnamese ESL students share many of the same pronunciation errors that ESL students from elsewhere do—consonant clusters, long and short vowel sounds, and swapping one consonant sound for another. Vietnamese is a beautiful, musical language…that has very little in common with English. But, there are 3 primary English pronunciation errors that native Vietnamese speakers should focus their attention on to see the most improvement in their English pronunciation—word stress, missing middle sounds of multi-syllable words, and final consonant sounds. Native speakers of English stress specific syllables when speaking multi-syllable words. It’s how the word is pro-noun-ced. Regional dialects within the US can affect word pronunciation and cause pronunciation errors—po-lice instead of po-lice—but these regional American accents are familiar to English listeners, so don’t pose much of a problem. Many Vietnamese words have 2 syllables and each syllable is written separately, though both are needed to convey word meaning. It’s also a syllable–timed language, meaning each syllable is given the same stress for an equal length of time. Vietnamese ESL students tend to speak English either without any stress at all, for fear of getting the word meaning wrong, or they apply Vietnamese pronunciation rules and stress each syllable the same. Mimicking native English speakers word stresses and sentence rhythms will help to learn the flow of English. Sing along with American songs, copy an actor’s dialog when watching movies. The more often you speak English aloud the better you’ll get at creating the correct sounds and stresses. Remember how I said Vietnamese has a lot of 2 syllable words? Around 80% of the words are disyllabic. That makes words with middle sounds unfamiliar. English, by comparison, has LOTS of words with middle sounds, some of them pretty complex containing silent letters, diphthongs, and consonant clusters—Wednesday, indebted, scientifically. Listening is key to correct this error. Try breaking the word into its individual sounds and linking them more slowly than your normal speaking speed. Vietnamese students struggle with pronouncing the English “z”, “s”, “t”, “v”, “ed”, “ks”, and “st” sounds because they have no equivalent in their native language. Unfortunately, these sounds often appear at the end of an English language word. Vietnamese ESL students will simply delete the sound or substitute a more familiar one—strive becomes sti or stib. Vietnamese English language classes in Vietnam have a strong focus on speaking but fall short when it comes to pronunciation and listening. These 3 English pronunciation errors made by Vietnamese ESL students can all be corrected in time, and by improving listening skills.